What is the Feedback Kiosk? 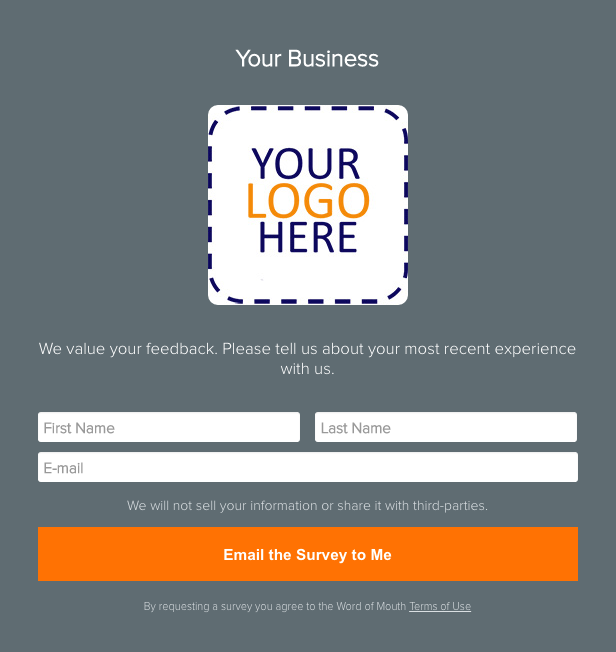 Why send your customers a survey? Can surveys be short and effective? 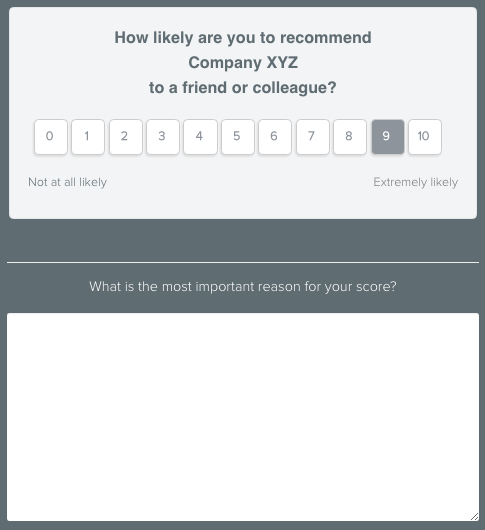 Who else uses Net Promoter Score surveys? Why use the Feedback Kiosk? How are happy customers handled? How are unhappy customers handled? Can I send surveys without the Feedback Kiosk? Can I get feedback for my staff? What happens when a staff member leaves? The Feedback Kiosk helps you manage your reputation – automatically! And it helps you be a customer-driven organization that delights customers and keeps on growing. To your customers, the Feedback Kiosk looks like a simple web form that clients fill out, and then the Feedback Kiosk sends them a survey – all with their permission, of course. The Feedback Kiosk figures out who your happiest customers are, and automatically asks them for reviews. The Feedback Kiosk also alerts you when a customer is unhappy so that you can address their issues immediately, before they vent to friends, colleagues, or worse – with an online review. Whether your business is #1 in your area or industry, or your business can improve, feedback surveys will tell you what you’re doing right and need to keep doing, and what things you need to change. Perhaps you are uncomfortable asking customers for a review, but more comfortable asking for feedback. The Feedback Kiosk will do both for you, removing the stress of asking for reviews. Short answer: Absolutely. 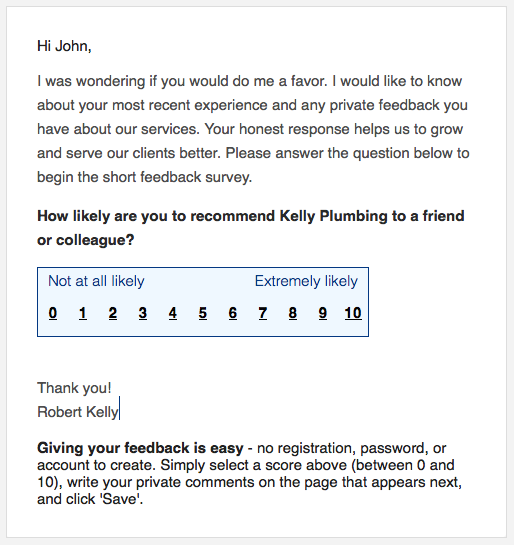 Surveys don’t need to be long and time-consuming to get to the heart of customer satisfaction. 1. Would your customer recommend your business to their friends orcolleagues, on a scale from 0 (not at all likely) to10 (extremely likely)? 2. Why did your customer give the score that they did? This simple survey identifies your most loyal customers who give you word of mouth referrals, and also identifies unhappy customers who might be actively speaking negatively of your business and harming your reputation. 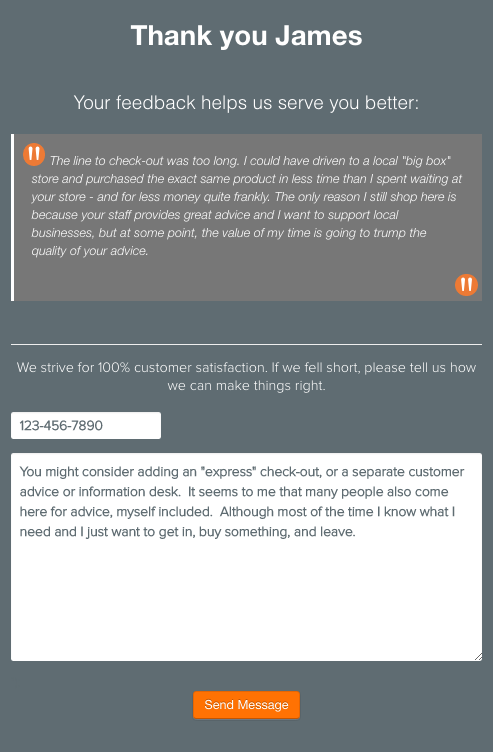 We store all of your customer feedback – their scores, who said what, and when they gave you their feedback. You can track your progress by seeing how your overall NPS score changes as you make changes to your business. Here’s a list of over 200 brands using NPS, many of which you will surely recognize. It’s quick and easy to use – the customer enters their information instead of you. Clients will often give you feedback if you ask. And if the client clicks on the “Email the survey to me” button, there’s a very good chance you’ll hear from them! It’s mobile – the Feedback Kiosk will run on any tablet or smart phone with a web browser that’s connected to the internet. No app to install or update. It’s real-time – instead of surveys going out to customers once a year or even once a quarter, surveys are sent on-demand – when a customer wants to give you feedback. You learn about the good and the bad immediately. You can use it anywhere – at your check-out counter, reception desk, waiting room, while customers wait in line, while meeting with clients, or at a customer site. It’s easy to deploy – whereas some feedback systemsrequire integration with your Point ofSales (POS) system or appointment scheduling software, the Feedback Kiosk does not require any costly integration or software maintenance to deploy. You can choose which review and recommendation sites are most important for your marketing, and then present those as options to your customer. We regularly add to the list of review site options. 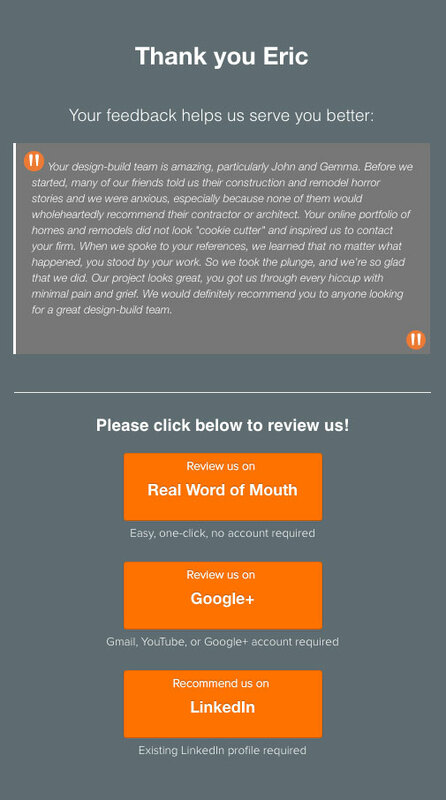 If you don’t see a review site that matters to your business, let us know and we’ll add it. The Feedback Kiosk collects everyone’s feedback, whether they are happy or not. But unhappy customers who say that they are not likely to recommend you (NPS Score = 0-6) are asked for a contact phone number and asked “how can we make things right”. This is different than only asking for how you can improve, rather this acknowledges that there is an issue, and communicates an authentic desire to change and “make things right” between you and your unhappy client. If you truly do “make things right”, you have the opportunity to convert an unhappy customer into a loyal one – a customer who will tell their positive story to friends and colleagues, bringing you new clients. 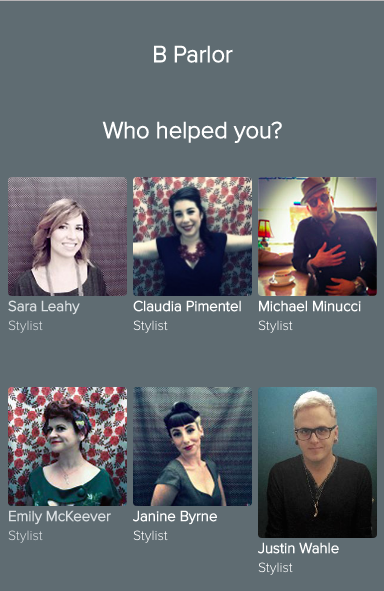 If you have a team of customer-facing professionals – sales people, consultants, stylists, instructors, attorneys, doctors – the Feedback Kiosk has a “Team” option where customers can talk about their specific experience. The Team option can motivate friendly competition among your staff, as they get more reviews – and more business, as a result. As a business owner, you can get unique insights into your team – insights that can help you improve and grow. Often online reviews will mention staff members in their comments. 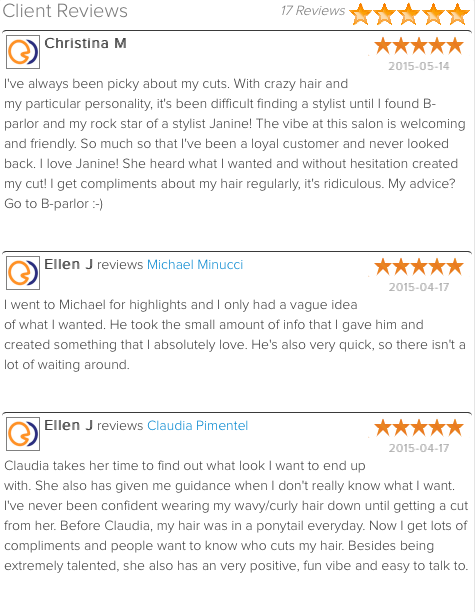 Prospects will read these reviews and then will ask to work with that staff member, too, if they like their reviews. But what happens when that staff member is promoted to a new role, or is no longer with your company, while prospective customers continue to ask for those people based on old reviews? With the Feedback Kiosk “Team”, when someone changes roles or leaves, you can remove their profile together with all the reviews associated with them.